Open up to new beginnings this summer with the limited edition J.C. Le Roux Chrysalis Collection and celebrate life in all its iridescence. Inspired by exhilarating rebirth through metamorphosis, each individual J.C. 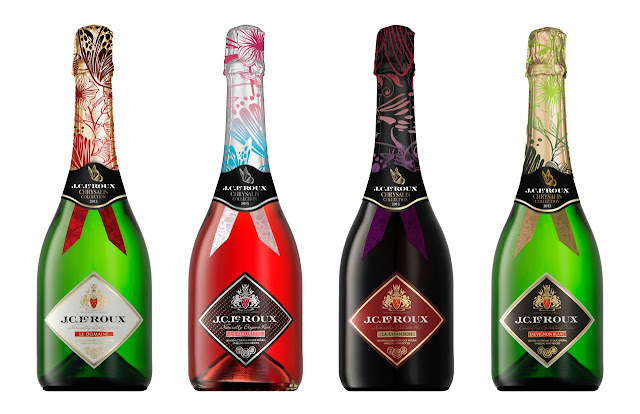 Le Roux sparkling wine has been transformed with beautifully designed foils and ribbons adorned with butterflies, birds, enchanted forests and flowers to represent new life. Just like a dull caterpillar emerging as a dazzling butterfly, the first blossoms of spring, seeds bursting with life or a beautiful bird hatching from an egg to take flight, summer is a time of change and renewal. With a dash of gold and red for Le Domaine, soft blue and pink tones for La Fleurette, burgundy for blushing La Chanson and a splash of green for the Sauvignon Blanc, each motif in the Chrysalis Collection is a vibrant expression of the inherent character of your favourite J.C. Le Roux. Boasting endless finesse and freshness, J.C. Le Roux Le Domaine comes alive on the palate. As a butterfly delights and uplifts, Le Domaine with its mouth-filling sweetness and clean finish will enliven any occasion. Free as a bird, the delightful pink La Fleurette entices all the senses with sweet, fruity flavours with hints of strawberry, plum and tropical fruit. This exuberant bubbly perfectly balances freshness and sweetness with its playful palate of strawberry and sensual plum followed by the richness of Muscat. Akin to the re-awakening of morning dew on a budding flower, J.C. Le Roux Sauvignon Blanc is a dry yet fruity sparkling wine with hints of tropical fruit, litchis, pineapples and granadilla. This refreshing bubbly shows a good balance and is light and clean on the palate. Ruby red J.C. Le Roux La Chanson is a lively sparkling wine with the allure of an enchanted forest. Teeming with life, the delightful mélange of sweet, fruity strawberry and plum bursts forth from your flute. The J.C. Le Roux Chrysalis Collection is a toast to new beginnings with a different exhilarating expression for every taste and occasion. Let J.C. Le Roux take you to the cusp of wonderful new beginnings with endless possibilities of things to come. The limited edition Chrysalis Collection from J.C. Le Roux is available nationwide at around R59 per bottle.